For the first day of our weekend getaway to Vancouver, my husband and I decided to go on a little adventure and take a 30-minute seaplane trip out to Victoria on Vancouver Island. The flight out to Victoria was fun, and the views were stunning. When we first arrived in Victoria, we did a whale watching trip on a Zodiak which was adventurous, to say the least. In the afternoon, we were scheduled to go out and see the beautiful Butchart Gardens. In between these two activities for our day, we had about an hour to kill in downtown Victoria to walk around, see the sights, and maybe grab a bite to eat. 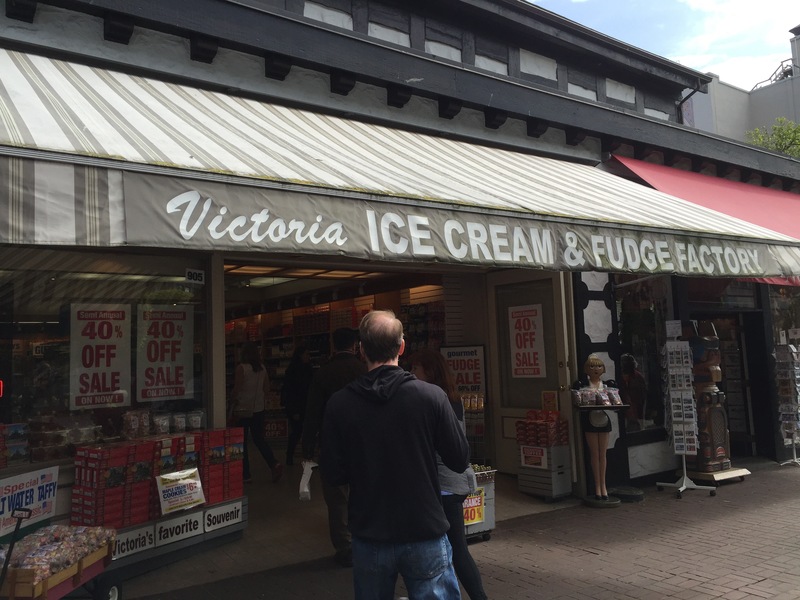 As we wandered around the streets of downtown Victoria and did a little shopping, we came upon a cute, old time ice cream and candy shop that I just couldn’t pass up. The Victoria Ice Cream & Fudge Factory had a huge sign outside advertising that they offered 66 different flavors of Italian ice cream, or gelato. Knowing what an ice cream fan I am, my husband said that there wasn’t anyway we could pass this up. So we decided to wander in to see what the store had to offer. While we were there for the ice cream, the Victoria Ice Cream & Fudge Factory offered so much more, as its name would indicate. There was a display case full of fresh homemade fudge, there was a “Gummy Zone” advertising fresh gummy’s that you could bag yourself, there was taffy, and there was a wide selection of Canadian cookies and treats that tourists could take home as gifts. But we were there for the gelato. On the counter, there was a sign explaining exactly what the difference between gelato and ice cream is. As it says, “Gelato is an Italian Ice Cream made from milk condensed with flavours, fruits and sweetners. 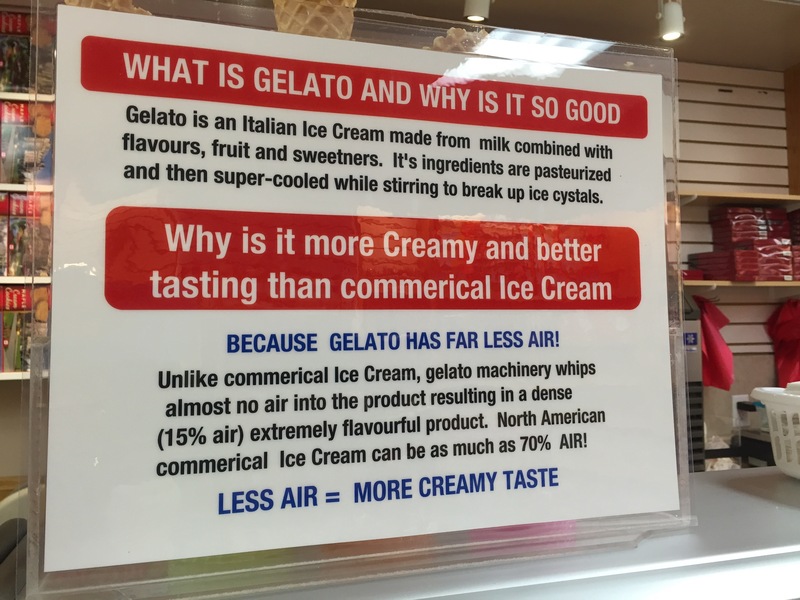 It’s ingredients are pasturized and then super-cooled while stirring to break up ice crystals.” The sign goes on to explain that because gelato has far less than than commercial ice cream, it ultimately is creamier and tastes better. If you’ve ever had fresh, homemade gelato, you can definitely taste the difference between ice cream and gelato, the flavors are fresher and the cream is thicker and creamer with a higher milk fat content and definitely more dense with less air. With 66 different flavors of gelato to choose from, this was going to be fun. All of the different flavors of gelato were so colorful and so artfully designed so as to be appealing to the consumer. And they all had fun names to go with their unique flavors. 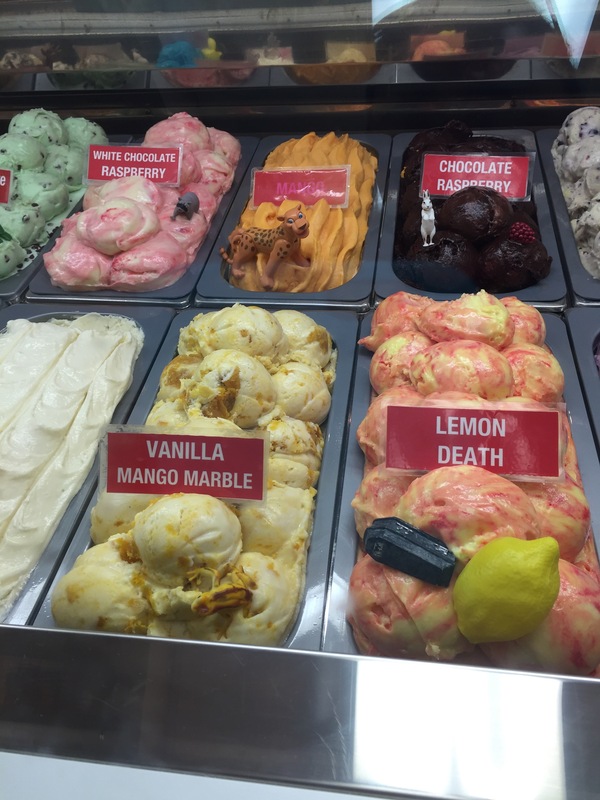 There was lemon death, chocolate raspberry, vanilla mango marble, mango, white chocolate raspberry and mint chocolate chip. Normally, I’d jump all over the mango, but this time, there were so many other flavors it was hard to choose from. Even the lemon death sounded amazing, a beautiful swirls of bright pink and yellow. I imagine it was extra lemon-y! 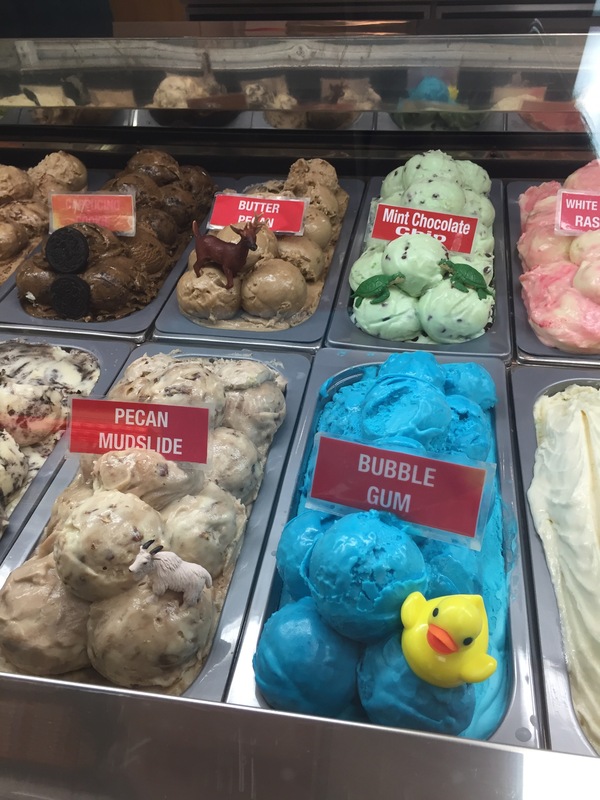 Bright blue bubble gum accented by a yellow rubber ducky caught the eye of the little boy in line ahead of me and he couldn’t resist. I imagine that by the time he was done with his cone, his face was going to be a nice blue mess. Pecan mudslide, butter pecan and cappuccino cookie were a couple of other flavors offered. Cappuccino cookie sounds really good to me, I’ve always been a sucker for coffee-flavored ice cream. BC berries was a nice purple color that I imagine would taste really good to those who love fresh summer berries. Berry cheesecake and strawberry shortcake were also both delectable offerings. 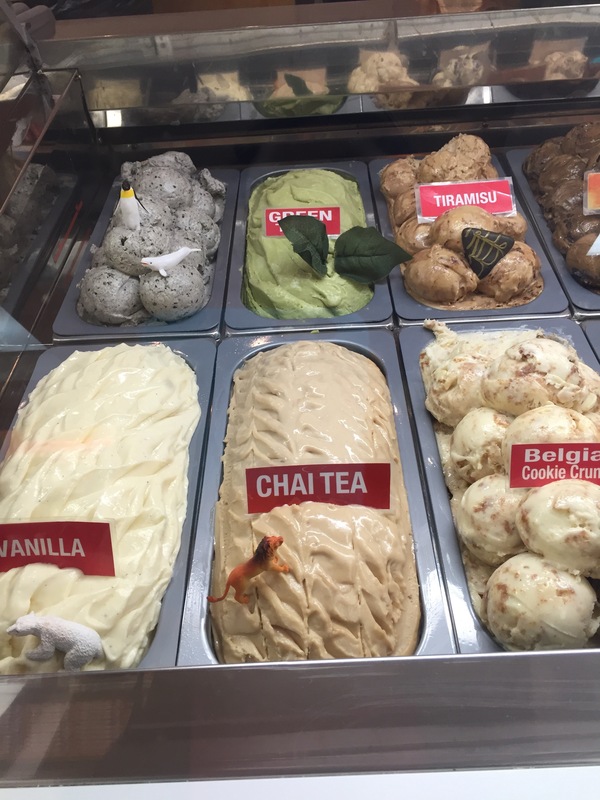 Some more traditional flavors included cookies & cream, green tea, tiramisu, vanilla, chai tea and Belgian cookie crunch. It’s when you taste flavors such as cookies & cream in a gelato form vs it’s ice cream counterpart, which is often found, that you can really taste the difference between the taste and quality of ice cream vs gelato. 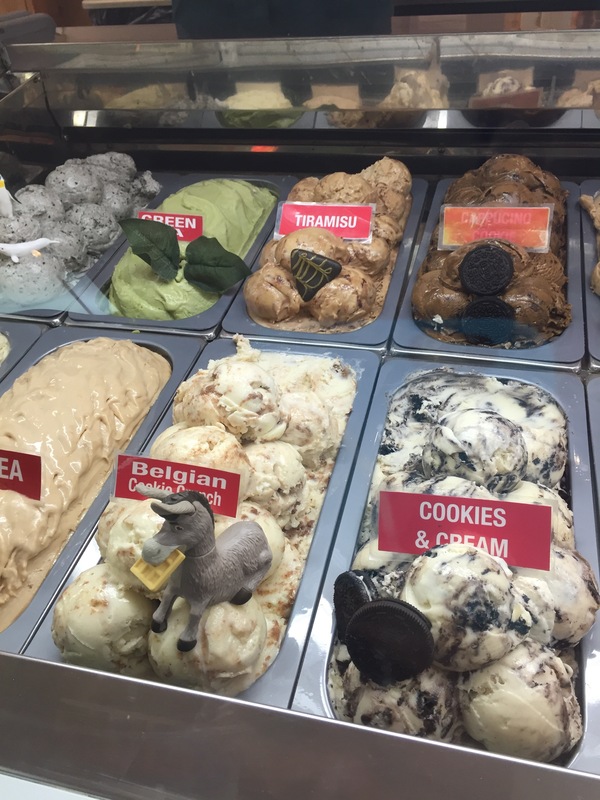 Other flavors offered included stracciatella, which is my personal favorite flavor. Stracciatella is the equivalent to chocolate chip in ice cream form. 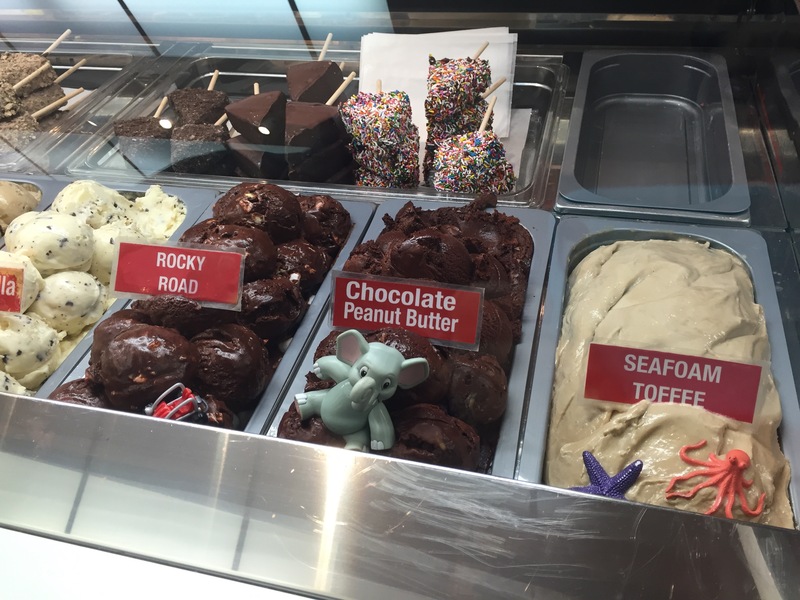 There was also maple walnut, rocky road, pistachio, Belgian chocolate, chocolate peanut butter and seafoam toffee. All of the chocolate flavors looked so decadent and luxurious. 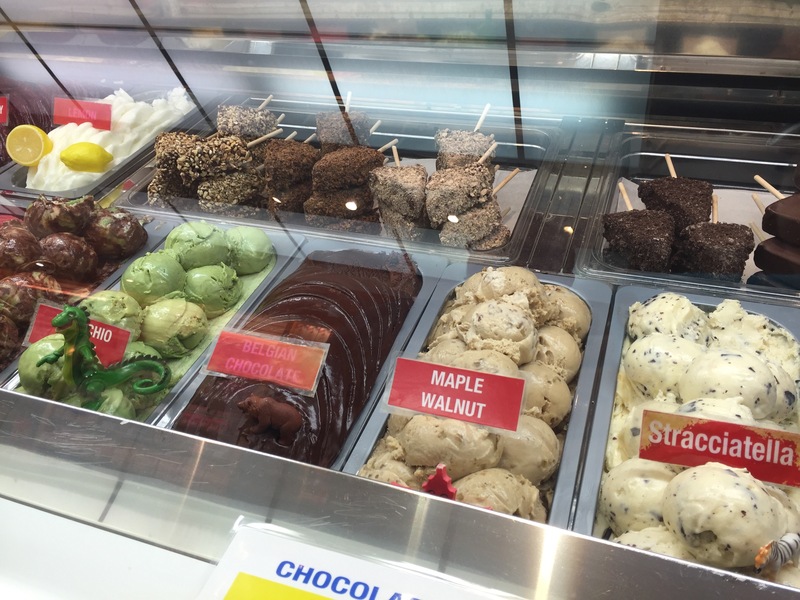 In addition to gelato, Victoria Ice Cream & Fudge Factory also offered cheesecake triangles, where the cheesecake were cut into triangles and put on sticks before being dipped in chocolate and coated in toppings such as cookie crumbs, rainbow sprinkles, chocolate sprinkles, and nuts. 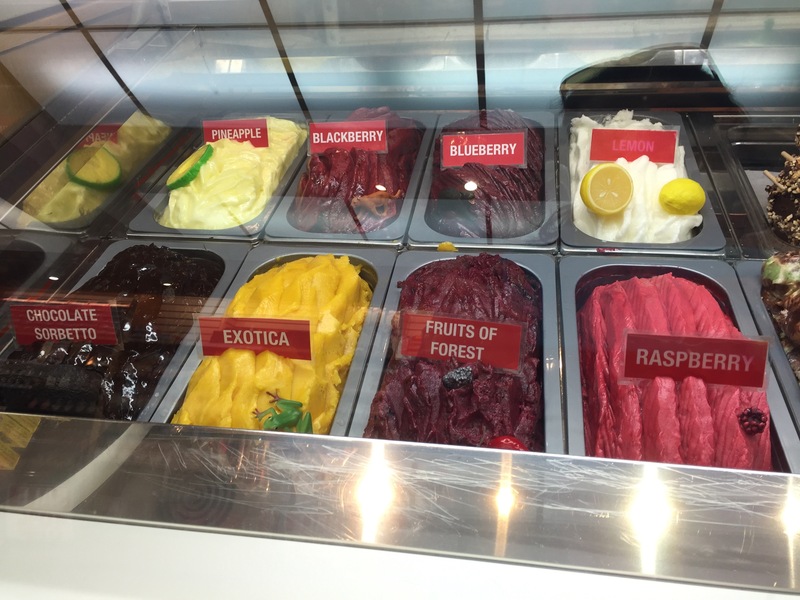 Finally, there was a whole section of non-dairy sorbets that included flavors such as chocolate sorbetto, exotica, fruits of forest, raspberry, lemon, blueberry, blackberry and pineapple. Of all of the flavor choices available, I couldn’t resist ordering a scoop of banana fudge on a cone. At first, I saw the strawberry banana and thought I wanted that as it’s a flavor combination you just can’t go wrong with. I even asked for a sample spoonful of strawberry banana, which was really tasty and not too sweet. 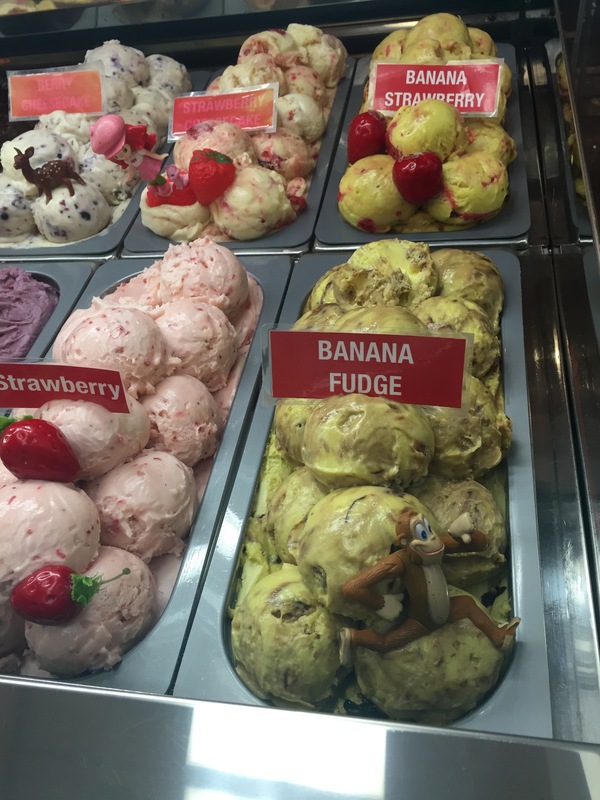 However, as soon as I saw the combination of banana and fudge, so that you get both the chocolate and the banana, then I really couldn’t exist. I loved my banana fudge. 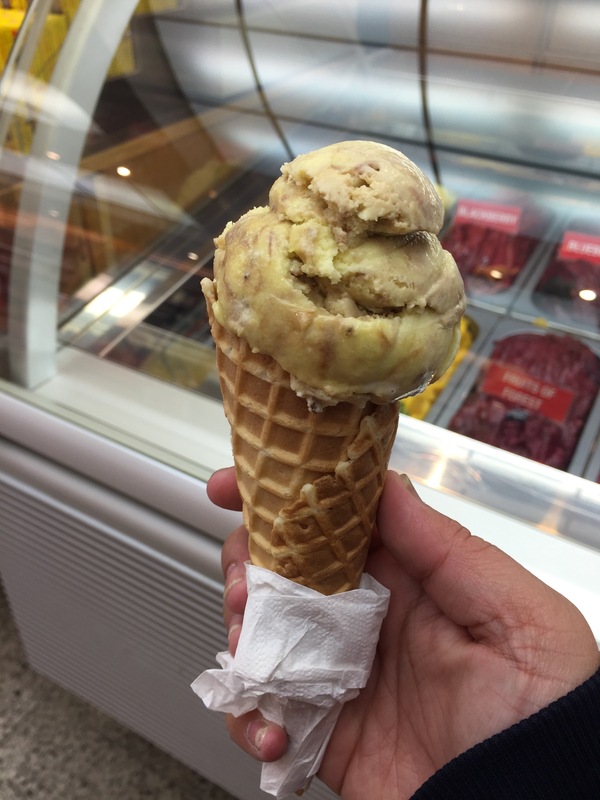 The subtle sweetness of the banana was always in the background providing sweetness to the gelato, but the swirl of chocolate fudge rounded out the flavor of the gelato making it creamy and rich. The flavor of this gelato was delicious and it definitely hit the spot on this afternoon. I was really happy with my choice. For my husband, he saw spumoni as a gelato flavor being offered and he knew he had to have a scoop. So a scoop of spumoni on a cone was his choice. One lick of the gelato and he absolutely loved it. Spumoni is an Italian favorite and generally made up of a mix of 3 different flavors, traditionally cherry, pistachio and chocolate. The mix of colors that make up spumoni really stands out and is quite colorful. It’s the mix of the flavors and how they come together that really make spumoni what it is. My husband loved the flavor combinations in this particular gelato flavor. He finished off his ice cream cone in a matter of minutes. 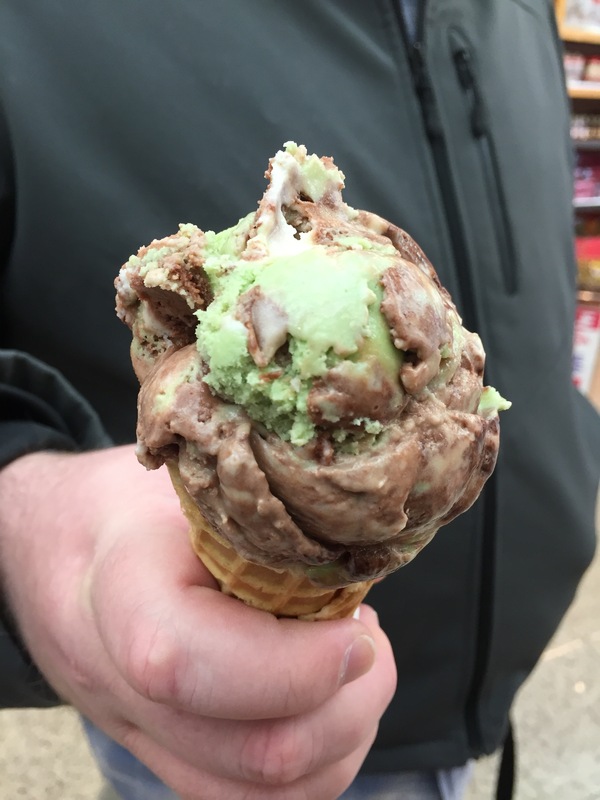 In fact, my husband loved his spumoni so much that at the end of the day, when we were running out of time during our visit to Victoria, my husband even suggested we make a quick trip back to Victoria Ice Cream & Fudge Factory so that he could get another scoop of spumoni to go! Victoria Ice Cream & Fudge Factory was a terrific midday snack break in between the activities we had planned for our day in Victoria. 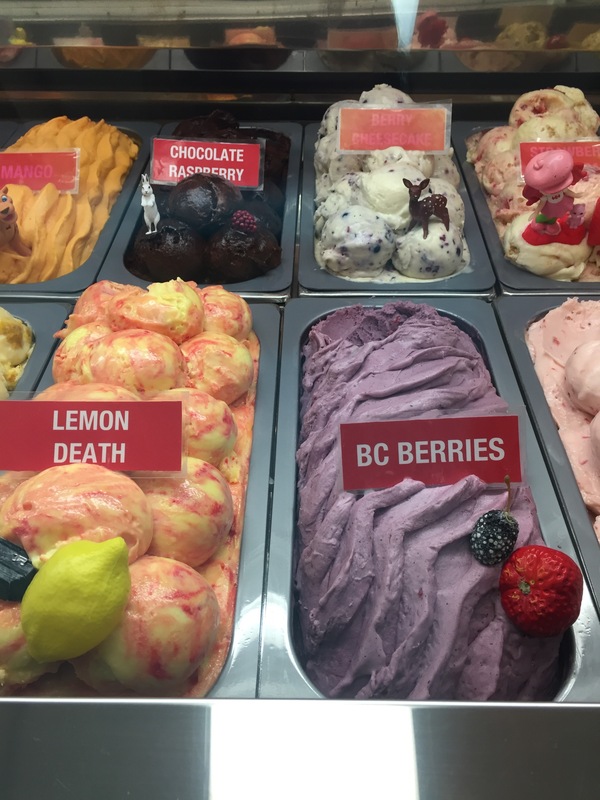 With 66 different flavors of gelato to choose from, its pretty much a guarantee that everyone will find a flavor that appeals to them. And with both traditional creamy gelato and sorbetto flavors, even those who don’t like dairy can find a flavor they can enjoy. My husband was so taken by find a spumoni gelato that he really enjoyed that he seriously considered a quick trip back to Victoria Ice Cream & Fudge Factory to get another scoop of gelato before we took our floatplane trip back to Vancouver. It’s pretty much a given that you can never go wrong with ice cream or gelato, and when you have this many flavors to choose from, it’s a win-win.